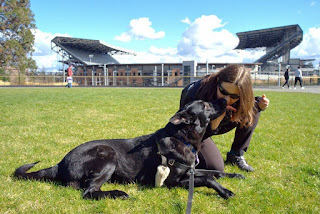 Tracy and Ana sharing a kiss outside Husky Stadium. Go DAWGS! Hello, and happy spring from Kate and Bella in Seattle! Nothing, and I mean nothing beats Seattle in spring—especially the flowers. Cherry trees, crocuses, daffodils, tulips—all emerge from winter’s darkness, offering bursting colors of hope. For those of you who don’t live in the Seattle area, here are my three favorite places to hang out and drink in Seattle's glorious spring sunshine. My author friend Tracy Weber spent six years getting a chemical engineering degree and a master’s in business from the University of Washington, so visiting it always feels like coming home. The Quad is a green belt between the social sciences buildings on campus. 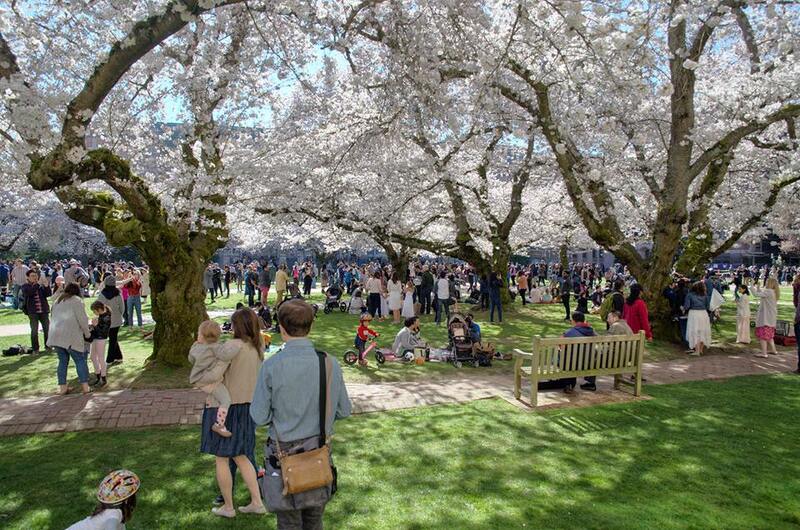 The Quad is practically a tourist destination during the two weeks each spring that its thirty Yoshino cherry trees blossom. The photo doesn’t do it justice. After you check out the Quad, be sure to hike around the rest of campus. You might see Tracy and her pup, Ana, sharing a quick kiss or posing for a photo or two. Seattle is famous for its parks—tiny snippets of wilderness smack dab in the city. 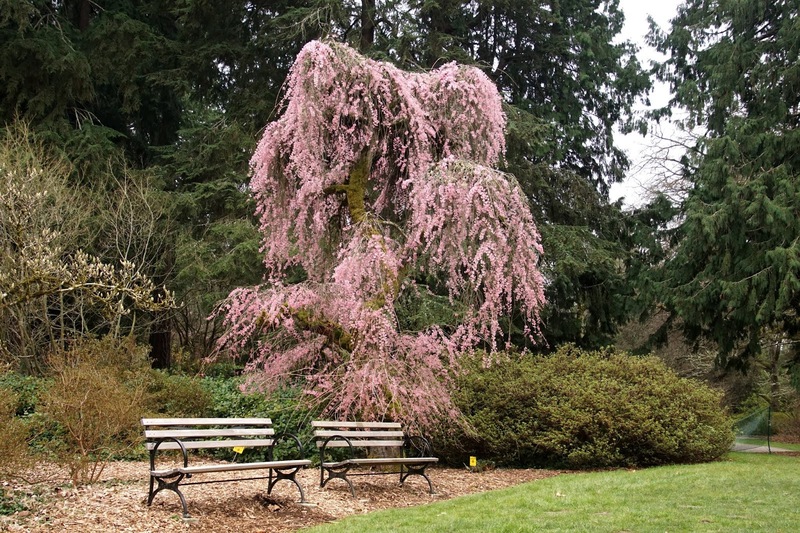 None is more majestic than the Washington Park Arboretum, which includes 230 acres of trails, ponds, and plant life. Bella’s and my favorite trail nestles up to Lake Washington. The Japanese gardens open each April, and you can visit the Graham Visitors Center gift shop year round. If you’re lucky, you can pick up a plant or two for your own garden. Finally, no article about my favorite Seattle places would be complete without mentioning Green Lake Park. 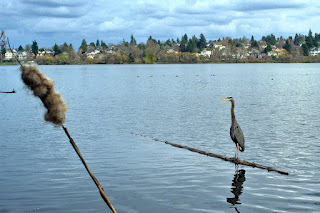 My third adventure, Karma’s a Killer, takes place at Green Lake, and it’s by far Bella’s favorite place to explore. In spring, the squirrels are out, taunting Bella to no end. The trees are in full bloom, and intrepid boaters hit the water for some rare Seattle Sun. The walkers among you will enjoy meandering Green Lake’s flat, 2.8 mile path. 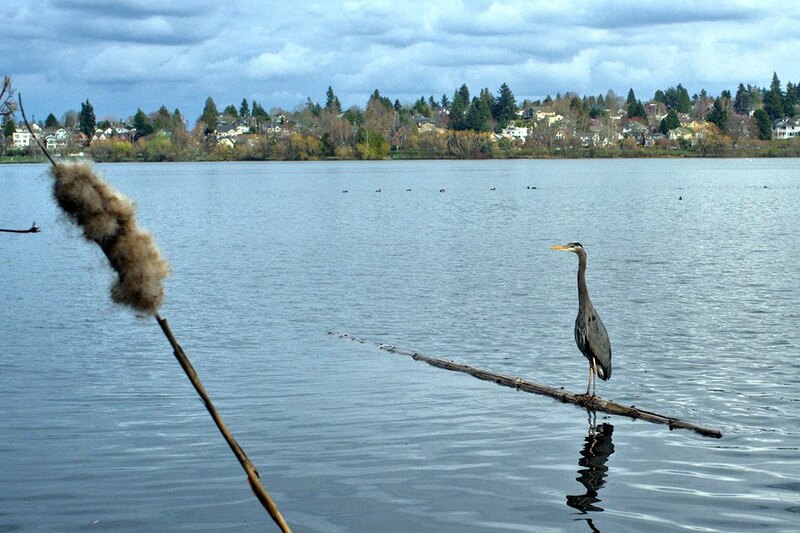 Be sure to keep an eye out for the lake’s turtles and resident blue heron while you’re there! 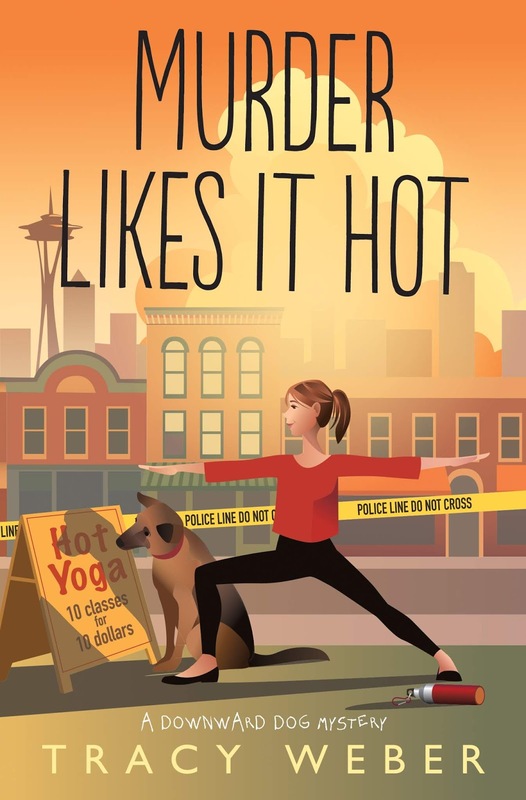 Check out Kate and Bella's newest crime-solving adventure in Murder Likes It Hot! I love your photos and would love to visit Seattle sometime. Waves and wags to you and Ana Pup! It's been a long while since I visited Seattle through work but it's on the bucket list of places to visit in the US with my hubby. I love the books in this series!! My pup says Namaste to you and Ana Pup! !